The long awaited sequel to Bethesda's hit 2012 game Dishonored is here. Announced at E3 2015, Dishonored 2 is out now, so here's what you need to know about Dishonored 2 news, deals, the free demo, and the DLC. Dishonored 2 hit shelves on November 11th 2016. Dishonored 2 is available on PlayStation 4, Xbox One, and PC. Now that Dishonored 2 has been out for a little while, we're beginning to see some great deals appear for the game. If you want to play on console, the best out there right now comes from Amazon: it's selling the PS4, Xbox One and PC versions for $29.99. And if you never played the first Dishonored and want to catch up before playing the newer game, you can get the Definitive Edition of Dishonored, which includes all the game's DLC, for $19.99 from Amazon. So, what can you expect in terms of gameplay in Dishonored 2? 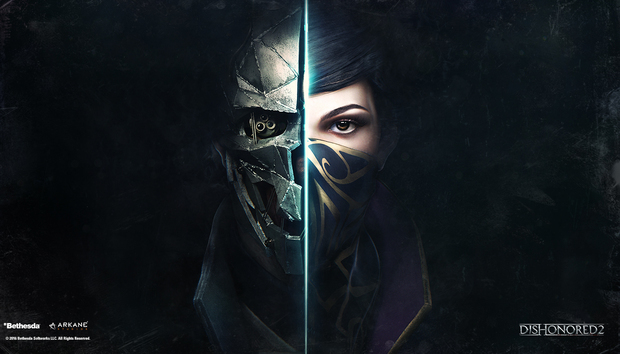 Unlike in the first Dishonored game, there are two main characters to play as; Emily Kaldwin and Corvo Attano. Corvo Attano is the guard-turned-assassin we all remember, and Emily Kaldwin is the daughter of the late Empress Jessamine Kaldwin, who you may remember was assassinated at the beginning of the first Dishonored game (and Emily is Corvo's daughter too, incidentally). However there's a twist - you choose who you want to play as early on, and that choice is set for the whole game. There's no switching between missions with this game, and both characters will offer very different styles of gameplay. "Emily fights with a little more finesse than Corvo does" Arkane Studios co-director Harvey Smith told Mashable. "Whereas Corvo has the very classic Possession, Rat Swarm, Blink, Emily has Far Reach, Shadow Walk, Mesmerize - these powers that nobody has heard of." "You can stick to walls, you can yank somebody toward you and assassinate them in mid-air, so you have these synced assassinations in mid-air," Smith said. "It begins to feel different, and it adds momentum. You can run and jump and it has rope physics to it." Bethesda has released a variety of DLC for Dishonored 2. Free Update 1 was released on PC, PS4, and Xbox One on 19 December 2016, and added a New Game Plus mode. Unlocked only after completing the game for the first time, it will let players create custom characters that mix and match the unique powers of Emily and Corvo. You'll also keep all the Bonecharm Traits and Runes collected on your first playthrough to use on the new character. There was even more customisation in Free Update 2, which arrived in January. That included Mission Select and more than 20 additional Custom Difficulty Settings, which allow you to tweak the game's challenge - including an 'Iron Mode' that removes manual saves and adds permadeath. If you want to try Dishonored 2 out but aren't sure that you want to commit to buying the game just yet, the good news is that there's a free demo so that you can try it out. Released on 6 April 2017, the demo includes the first three missions of the game, and lets you play as either of the two protagonists. If you decide you're a fan, you can upgrade to the full game and continue right where you left off. The demo is available for PS4, Xbox One, and PC from the respective online stores. Following the release of Dishonored 2, reports have been flooding in claiming that the PC variant of the game is 'broken' with a plethora of gameplay and performance issues. Gamers claim that computers that can run Battlefield 1 in Ultra settings can't even get Dishonored 2 to hit 30fps on medium settings. Following the outcry, Bethesda has responded with a list of tips and tricks to help PC gamers get the most out of the game while the company fixes the issues. Gamers are advised to run the game in high to achieve the desired 60fps performance, and only those with PCs that "far exceed" those recommendation should try playing with Ultra settings enabled at this moment in time. Two patches have been released to try and address the PC performance issues so far, and at least some of the problems have now been resolved. Dishonored 2 comes from the award-winning Arkane Studios and takes your protagonist - choose between Corvo Attano and Emily Kaldwin - to the coastal city of Karnaca where the choices you make will have significant impact on the world.